Police in the Italian port city of Bari in southern Italy have arrested, on Tuesday 05/10/2016, two Afghan men, Hakim Nasiri (pic-L), 23, and Gulistan Ahmadzai, 29. suspected of plotting jihadist attacks in Italy, France and the UK. Two other Afghans, Surgul Ahmadzai, 28, & Qari Khesta Mir Ahmadzai, 30, are on the run. It is believed they fled to Kabul, Afghanistan.Italian media report. 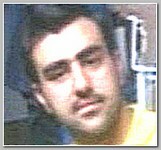 Hakim Nasiri was described as a ‘human bomb’ . Video clips and photos on the two detainees’ mobile phones suggest that they were targeting landmarks in Bari, Rome, Paris and especially London for attacks. They included hotels in London’s West India Quay and Royal Victoria Dock. The apparent targets in Rome were the Circus Maximus and Colosseum. Police believe the Afghans had formed a jihadist cell linked to so-called Islamic State (ISIS). The Bari investigators said one of the suspicious images showed a famous mosque in Mecca tinted blue – a colour associated with Islamic paradise and devotion – and the Eiffel Tower tinted violet – a colour associated with death and struggle. Another photo showed Hakim Nasiri next to the Mayor of Bari, Antonio Decaro, during a march organised on 10/19/2015 in solidarity with immigrants. Both suspects held by police have been living in Italy with humanitarian protection status. Hakim Nasiri is accused of international terrorism and Gulistan Ahmadzai of assisting illegal immigration. Italian police said the migrants had been handed documents equivalent to EU passports which enabled them to travel between countries in the Schengen zone – which does not include the UK. The Home Office could not explain how Surgul Ahmadzai had been able to travel to Britain, and how long he had stayed. In Bari they had filmed the Ipercoop shopping mall, the inside of Bari Palese airport and the port area. Police claimed the suspects’ recordings included video tributes to friends and relatives of suspected Islamists held by the US authorities in Guantanamo, Cuba.